This adorable girl doll is realistic with her many little baby wrinkles and endearing face. We love her cosy sleeping bag. This adorable newborn baby girl doll is realistic with her many little baby wrinkles and endearing face. We love her accompanying sleeping bag. Her head and limbs are made from gorgeous soft touch vinyl. Her eyebrows, cheeks and mouth are very naturally painted and her hair is moulded and lightly painted brown. She comes with a dummy accessory but this does not fit inside her mouth. She is dressed in a pink short romper with a bow and has a charming little hat with a grey pom pom on her head. In addition, she has newborn no-scratch mittens on a string. The set includes a warm white sleeping bag with grey embellishment. The head part of the sleeping bag is edged with soft grey plush fabric. 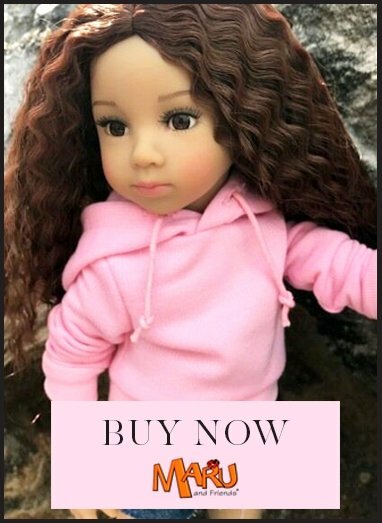 The doll is packed in an charming box, perfect for a gift.